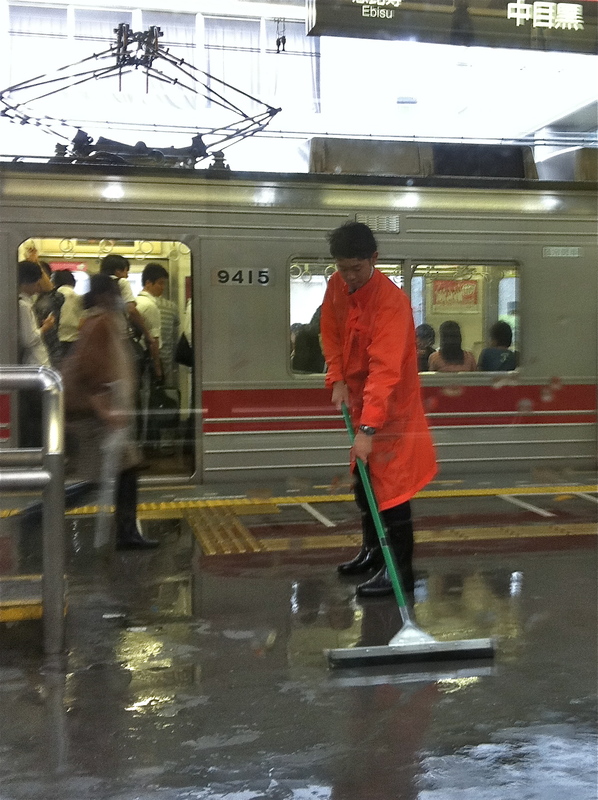 This intrepid subway worker’s job was to deal with the rain that suddenly smashed down ankle-deep on the Nakameguro Station platform during Wednesday’s typhoon. If you’ve ever been caught in one, you’ll see why this guy has job security! Afterwards, as I walked to the Meguro Ward Office during a lull in the festivities to collect my spanking new Resident Alien card, I spotted the usual typhoon casualties: toppled signs, blown-out bumbershoots, and one clear umbrella skin without any ribs or handle, slumped on the sidewalk like a beached jellyfish.